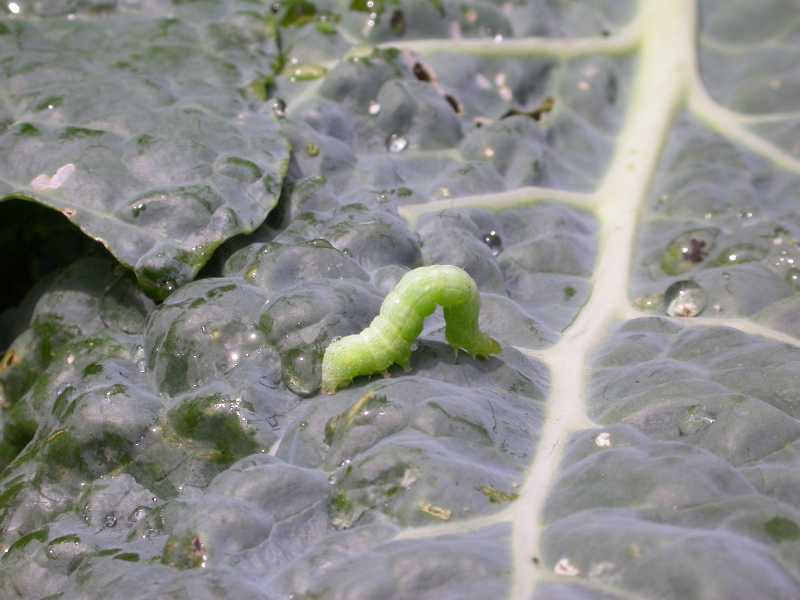 The cabbage looper, Trichoplusia ni, is a serious pest of cruciferous plants such as cabbage, cauliflower, broccoli, and brussels sprouts. The adult cabbage looper is a gray, mottled moth with a characteristic white or silver "Y" mark on each forewing. The larva is a smooth, greenish caterpillar with thin white lines on its back and sides. It crawls in a looping motion. Cabbage loopers are present nearly the entire growing season. The cabbage looper also attacks carnations, nasturtium, lettuce, spinach, beets, parsley, potatoes, and tomatoes. 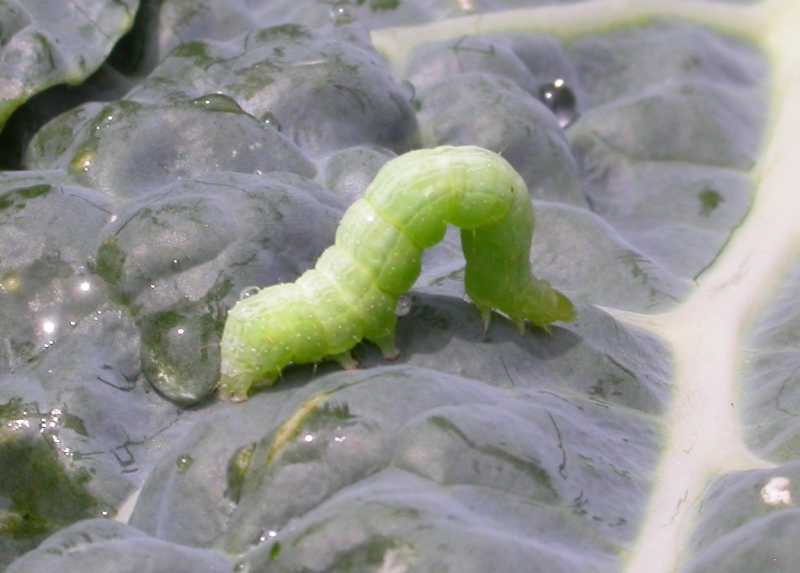 All cruciferous plants at all stages of growth are attacked by cabbage loopers, which are capable of completely defoliating plants. 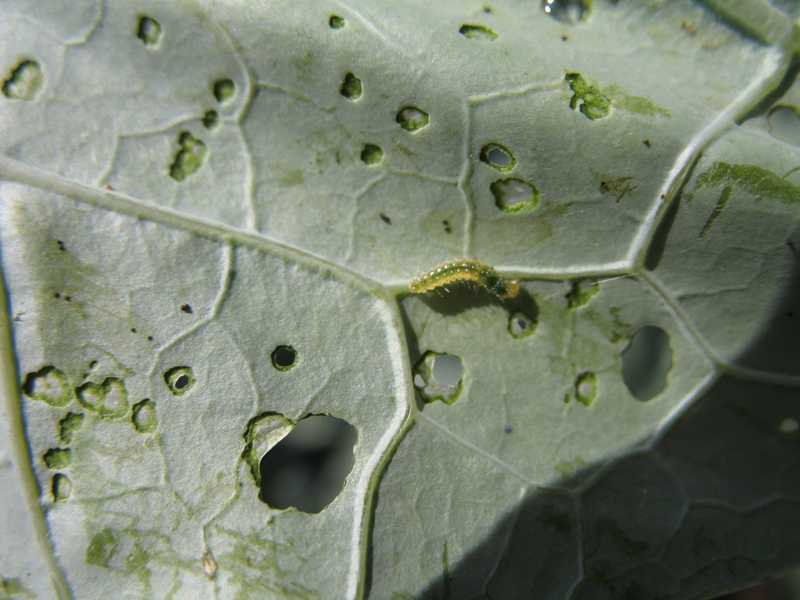 Larvae feed on the underside of developing leaves. 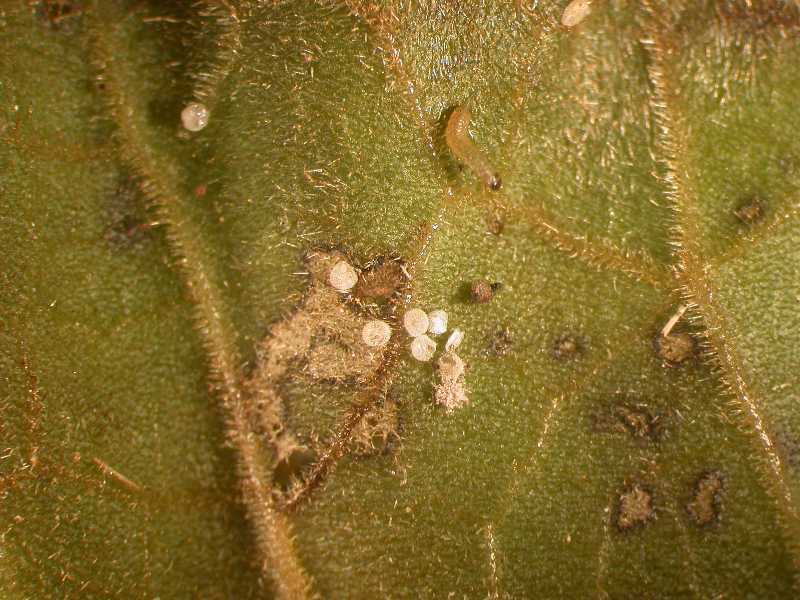 Outer leaves become riddled with small irregular holes. If leaves are parted, masses of greenish-brown pellets of excrement are found at the bases of the leaves. Heads of cabbage and cauliflower are stunted. 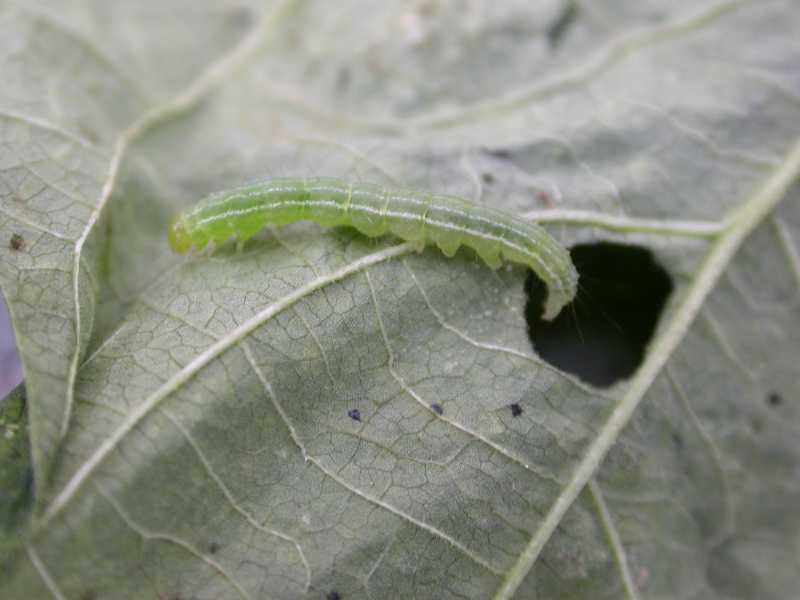 The cabbage looper overwinters in a cocoon on plant debris. The moth emerges in spring and is active at night. 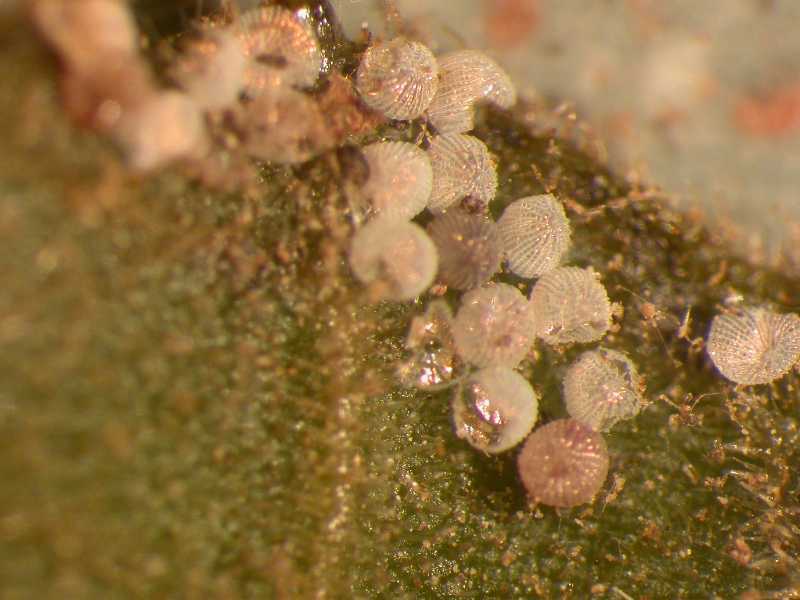 It lays round, pale yellow eggs on the upper and lower surface of the leaves. The eggs hatch in 3–10 days. Larvae are 1-1/2 inches long and are green with pale stripes down their back. They loop their bodies as they crawl. The caterpillars feed on plants for 3–4 weeks. 1. Handpick insects. 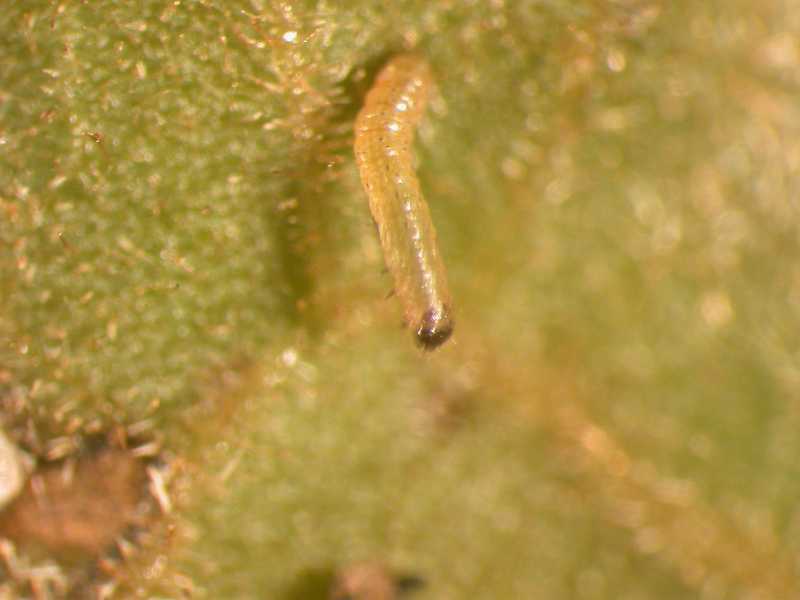 When plants are young or only a few larvae are present, handpick the larvae and egg masses. 2. Use row covers. Once plants are insect-free or before they become infested in the spring, cover the plants with one of the light row coverings, which will prevent adult moths from laying eggs on the plants. 3. Plant tolerant varieties. The green cabbage varieties, ‘Green Winter’, ‘Savoy’, and ‘Savoy Chieftain’, all exhibit some resistance to attack by cabbage looper. The red cabbage varieties are generally less preferred by cabbage looper. 4. Fall sanitation. Clean up and dispose of all plant debris after harvest to remove the overwintering pupae of the insect. 5. Control weeds. Since the caterpillars can overwinter on weeds, remove weeds such as wild mustard, pepper grass, and shepherd's purse which can harbor the pest. 6. Use insecticidal soap or Bt spray. Caterpillars can be controlled with the use of insecticidal soap or Bacillus thuringiensis (Bt). Bt is a bacteria which causes the caterpillars to become sick and die. It may take several days before the insects die, but feeding generally stops shortly after spraying. Small loopers are more easily controlled with Bt than larger ones. 7. Use insecticidal sprays. 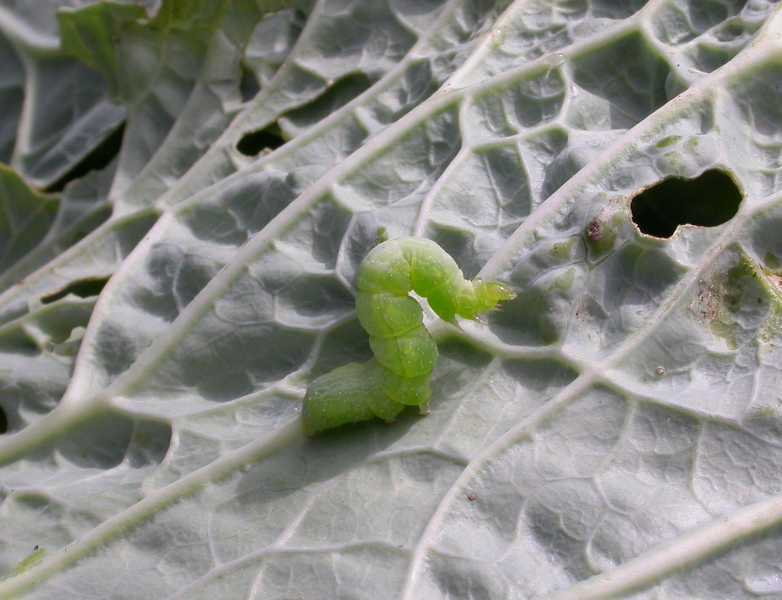 Common insecticides that control cabbage loopers include pyrethrins, cyfluthrin, carbaryl (Sevin), permethrin and spinosad. Strategies 1, 2, 3, and 4 are strictly organic approaches. Strategy 5 could be considered an organic approach, if strictly organic means of weed control (e.g. removal by hand) are used. For an organic approach to Strategies 6 and 7, consult the Organic Materials Review Institute (OMRI™) for appropriate insecticidal soap, Bacillus thuringiensis (Bt), spinosad and pyrethrin products. 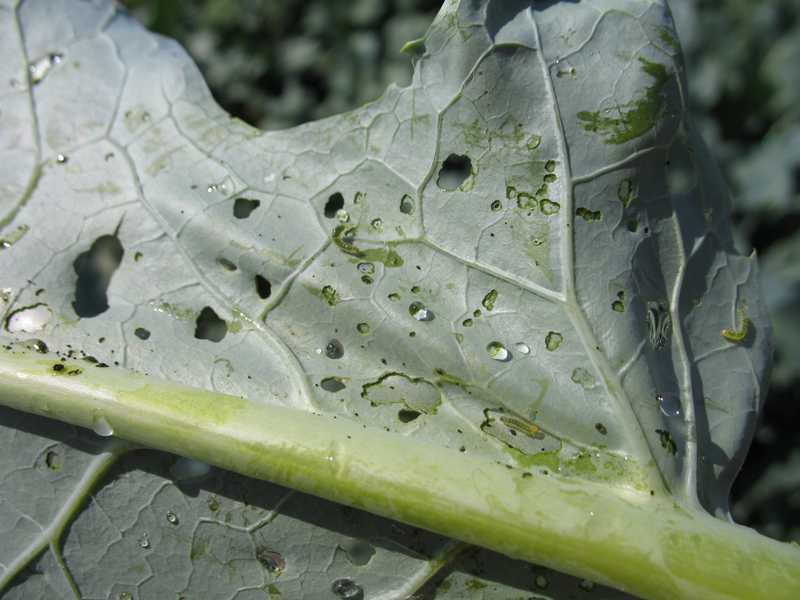 The jagged holes in this broccoli leaf (Brassica) are typical of feeding by cabbage loopers (Lepidoptera), which can be very difficult to see; there are three early stage loopers in this picture.